Verify operates as a testing ground for its users to offer things like screenshots and mockups of products, even advertising, and put them out for public consumption ahead of launch. The most recent version of the startup includes support for multiple devices, thus allowing them to offer up the version of whatever it is to be tested for a particular device on that device, as well as multivirate testing, allowing for multiple versions to be tested at once. 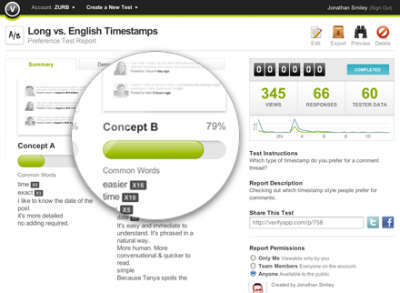 Verify also offers a variety of different tests on the same item, including basic preferences, a mood test (more specifically, just what mood does the thing being tested evoke in the users’ minds), as well as a memory test, allowing users to determine just what they remember about the thing you’re testing after they’ve seen it for five seconds. 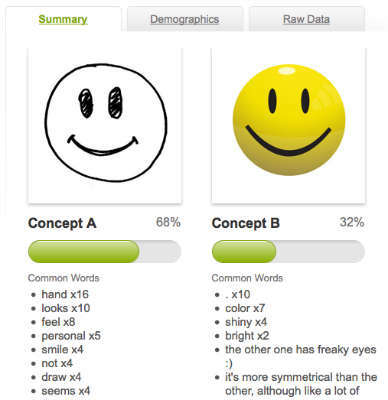 Upon completion of the tests set up, the designers then get access to detailed reports about the responses and the demographics of the people who used the service. There’s a 30 day free trial, and paid plans start at $19 a month with options to go up from there. The multivariate testing, sadly, only comes on the $99 a month plan. For any small business doing business on the web, whether in part or in whole, something like this could be extremely useful. It would be like having a virtually on-demand market research facility for a small monthly cost, and that’s especially good for those businesses that roll out a lot of product or redesign websites on a regular basis. And as is generally the case, having a robust cloud-based telephony profile waiting to keep up with the hopefully substantial influx of customers following successful market testing, such as toll-free numbers and hunt groups to ensure ease of making contact and finding someone once the users do make contact, will be just as smart an idea. Information, especially timely information about your target market, is always a welcome addition to most any small business’ lineup, so looking into ZURB’s Verify will likely pay dividends of its own.